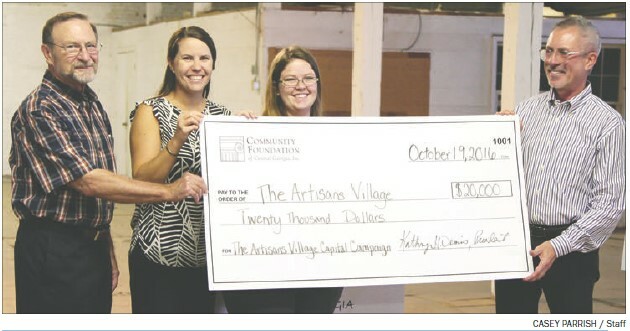 Downtown Eatonton’s Artisans Village has received a $20,000 grant check from the Community Foundation of Central Georgia. A special Oct. 19 ceremony in one of the Artisans Village’s historic cotton warehouses was used to announce the grant. The money will enable the Artisans Village to meet its goal this month of purchasing the historic brick cotton warehouses and livery stable from current owner Stewart Aaron. The $20,000 grant is significant, because it is the first gift outside of CFCA’s old geographic boundaries, according to Briar Patch Arts Council President Lou Benjamin. The Artisans Village is a 501(c)(3) nonprofit corporation and was established as an economic development art tourism venture, according to a Artisans Village news release. It is part of a collaborative effort to revitalize the region through increased cultural tourism. 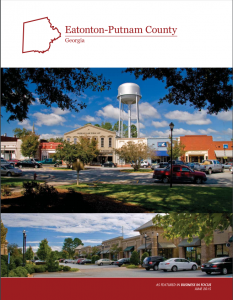 Its stated goals include bringing a broad assortment of artists and their artwork to Putnam County, generating tourism revenue and partnering with the Eatonton-Putnam Chamber of Commerce, Eatonton Main Street, Georgia Writers Museum, Plaza Arts Center, Georgia College, Putnam County High School and local businesses. Nov. 1, 2016 — Purchase the historic brick cotton warehouses and livery stable at the City Center Parking Lot. July 1, 2017 – Open the renovated livery stable (the brick building in the middle of the City Center Parking Lot. July 1, 2018 – Open the renovated warehouses (the cluster of brick buildings off the far east side of the City Center Parking Lot).